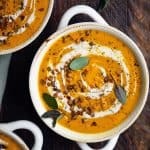 This is such a flavorful, creamy soup – perfect for a cozy autumn evening! In a large pot over medium heat, sauté onion and garlic until translucent & softened. Add in rest of ingredients. Bring to boil, then reduce heat to medium. Cover and simmer until veggies are softened (approx 45 minutes). At this point, add in hemp seeds and maca powder if using. Use either an immersion blender or regular blender to puree soup until smooth. (If using a blender, be careful when transferring soup to blender and vice versa! You may have to do this in two batches.) Taste and adjust spices as desired. Serve topped with crunchy lentils, a dollop of plain yogurt or coconut milk and fresh herbs. For a more filling dinner, you can also serve over cooked lentils, rice and/or quinoa.